My first reminder of the Lebanese approach to customer service is at check-in at Heathrow. As I fly economy I expect to be treated as cattle anyway and join a queue of disgruntled passengers carrying suitcases packed to the brink. I am positively surprised when things run smoothly and head to the departure lounge where I bump into a number of my compatriots thriving at the sight of Tax-Free designer gear . After the customary unexplained delay at the gate I finally get on the plane only to find that my overhead compartment has already been filled with items belonging to passenger in seat 23C (It is worthwhile mentioning I am seated in 10B) who stares at me with beady eyes ready to pounce at the slightest sign that I might displace them. I sit down with a book hoping for some peace and quiet. The middle-aged gentleman to my right has other ideas and decides that delving into my past, present and future would be the most appropriate way of spending the next 5 hours. He has his own sharing to do, and after making judgmental comments on various issues including race and religion, informs me casually he had benefited greatly from arms trading in the late 80s and applied for political asylum in the 90s under false premises. I smile uncomfortably unsure if I am meant to show approval or contempt at the risk of triggering another lengthy and pointless discussion. The lady to my left seems delighted when I order wine with my meal. She asks me where I am from, which in Lebanese code, stands for ‘what religion are you?’ My name usually gives it away anyway but I guess there is no harm in double-checking. One topic leads to another and I realize I have fallen prey to an attempt at converting me to Evangelical Christianity. I keep my answers vague and polite until relief comes from the captain’s announcement that we are beginning our decent to Rafik Hariri International Airport named after the late prime Minister assassinated in 2005.I hear sneering and disapproving noises from the front. It should be ‘Beirut International Airport’ says someone loudly. 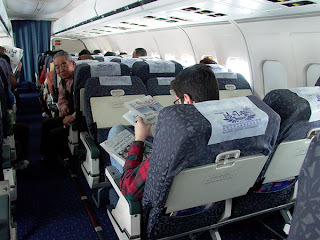 Another sign of the growing Sunni-Shiaa tensions in the country which vanishes as the plane touches ground to the sound of clapping and a standing ovation despite the fasten-seat belt sign. We are all happy to be home and our journey only begins.